I was on the couch yesterday morning when I heard a loud thump outside. Tuck barked. I ignored it. Then I heard another thump, and Tuck got up and went to the front door, where he went crazy, growling and barking and whining. Of course I got up and when I looked out the front door, I saw my neighbor’s two horses at the end of my front walk. Looks like my neighbor had forgotten to close her gate and they’d escaped, again. I knew my neighbor wasn’t home. While I called both her numbers and just got voicemail, the horses made their way to the back field by the garage. For the next hour or so I kept an eye on them to make sure they didn’t head for the road, and I waited for my neighbor to call to say she was on her way over to capture them. 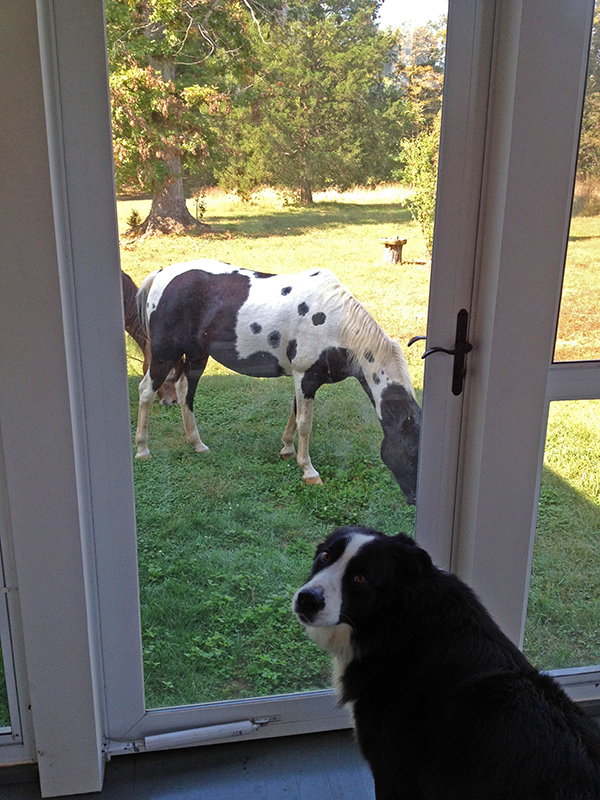 Well, I was still waiting when the horses came up around the house garden and started to nibble my landscaping. When one of the horses shoved his muzzle into a container of just-sprouted lettuce, smushing the baby plants into a pulp, I got a bit annoyed and realized that if I wanted my plants unscathed I would need to remove the horses. Easy, right? Except I am at best uncomfortable around horses, and at worst very afraid of being near them without a fence in between us, especially when I am all by myself. I have had enough scary experiences around and on horses that I don’t really feel the need to hang out with them ever again. But I had to do something, not only to save my garden but also any unsuspecting motorists that might be driving up the road when one of these horses got an idea to bolt. When another neighbor had captured these horses the first time they escaped, she led one by looping a huge horse rope around its neck. And horses, being herd animals, will tend to follow each other. If I could get one horse home odds were the other would follow. Only trouble is I didn’t have a rope that was stout enough to lead a horse. So I grabbed Tuck’s longest, heaviest leash and hoped it would hold. Tuck was still going nuts on the porch, his order-loving mind just blown by these very large, very alive, and very out-of-place creatures that had suddenly appeared in his domain. Something was. not. right, and with every language he had Tucker voiced his concern, eyes round as saucers and ears pinned back flat to his head. While Tuck paced and whined and watched with the most consternated expression I’ve ever seen him make, I offered the black and white horse a couple of placating carrots as I gingerly petted his head. Then I looped the leash around his neck, holding both ends in my fist, and started pulling him toward home. It took some persuading—the appeal of lush new grass is high—but I got him moving. I had to walk with my hand basically against his neck because the leash way too short to properly lead a horse. But I got him going at a pretty fast clip and held his head up so he couldn’t dally and snag more grass. This put me walking uncomfortable close to him, but I just tried to stay aware and away from any of the parts that could kick me, rear up, smash me against the fence, or otherwise bash in my skull, which was feeling very tiny and exposed next to this giant mass of twitchy muscle. I got the horse all the way home and into the gate by his barn, which sure enough was open. I had to push him pretty hard to get him through, as he didn’t want to leave his freedom. 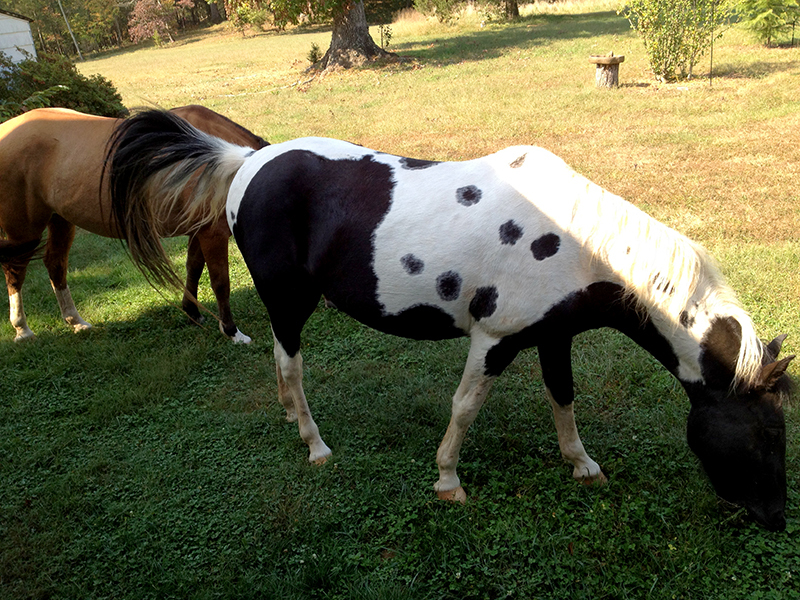 The brown horse had galloped along side of us, frolicking in the newly hayed pasture. Unfortunately, he didn’t follow his buddy into the gated pasture, and instead headed further out to graze. I knew he was the more spirited of the horses, according to his owner, and he’s also bigger, so I had to steel myself to approach him. I got the leash around his head and had to pull with all my might to get him to stop eating grass. It must have been a pretty silly scene, me trying to move a stubborn horse with what amounted to a shoelace. But after digging my heels in I got his head up and got him moving along toward the gate. He tried a few more times to stop to graze, but something about my militant march must have made him realize I meant business. I got him in the gate, where he and his friend kicked up their heels and laughed at their little adventure as they took a victory gallop around the field. Then I went home, left my neighbor a message that I had gotten her horses in, and spent the next two hours shaking from all the adrenaline that had just flooded my body. And I have to say, this little experience emphatically confirmed that I prefer my horses as beautiful lawn ornaments in my neighbor’s field, with the gate firmly latched. Very brave of you!! What we do to save our gardens! Your neighbor would be very annoying to me at this point. Are her horses escaping/being Houdini somehow or she being neglectful with the gate? She is being neglectful of the gate! 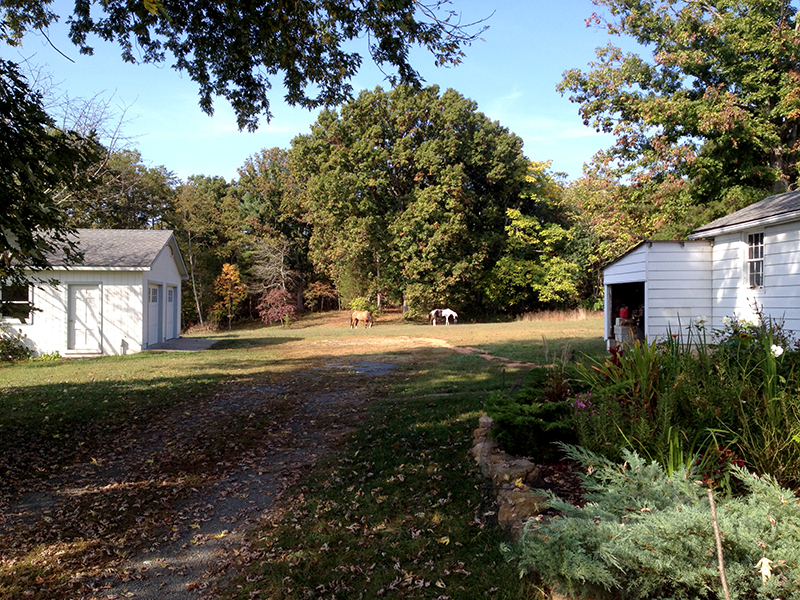 You are currently reading Loose horses: Facing fear in defense of the garden at Bonafide Farm.